I can tell that Christmas is right around the corner not just because all the stores are starting to set up their displays – and are already selling artificial Christmas trees. But, because I have started receiving emails asking for ideas to celebrate the holidays when you have very little money. Instead of responding to each one individually I thought I would share some ideas here. As a mother, I know the desire to create magical experiences where the memories will last my children’s lifetime! 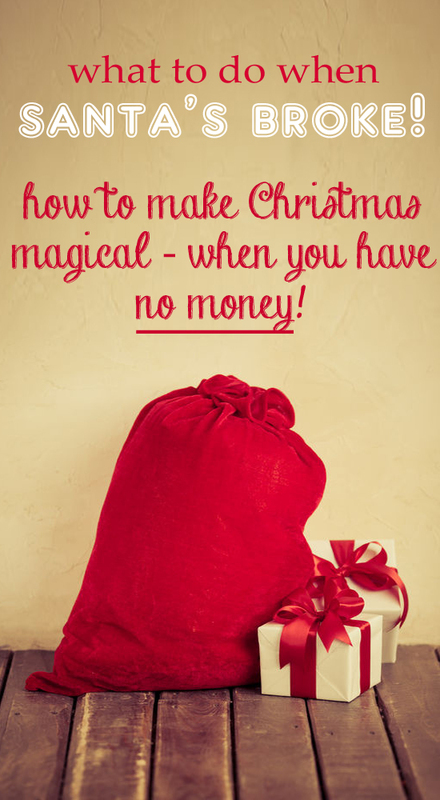 Not having the money to be able to provide a Christmas experience (Yes, that means more than just gifts) would be stressful, but all is not lost – I promise that with a little creativity and some planning – you can have the best Christmas ever! Note- Let me just take a second to say this before I get a million messages – YES, I know that the Holidays are about so much more than gifts… I get that. However, that does not mean the desire to give and receive presents goes away – simply because you cannot afford it. When money is tight, buying gifts can cause a lot of stress! 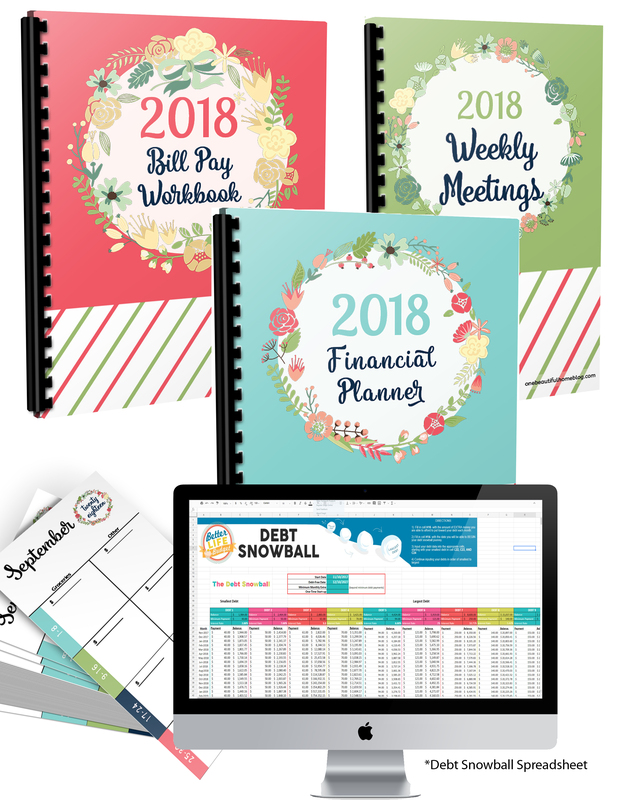 I think it is really imperative that you contact your family to give them a heads up that money is tight this year – and that you will be focusing your finances on your immediate family first (spouse and kids). If you find some wiggle room, by all means, buy/make what you can for your extended family! The presentation can make a HUGE difference. Maybe there are only two or three presents under the tree, but when wrapped and decorated beautifully – everything seems more exciting. I love how these gifts look, and it is so inexpensive! Brown craft paper – plain red ribbon and a marker! Wrap EVERYTHING! Seriously. Unwrapping the presents is thrilling. Especially for younger kids. Growing up every.single.item was wrapped. Everything in our stocking and every gift. When Scott and I started dating, he thought that wrapping stocking stuffers was insane. It is not. It makes Christmas morning last longer – and it is fun! 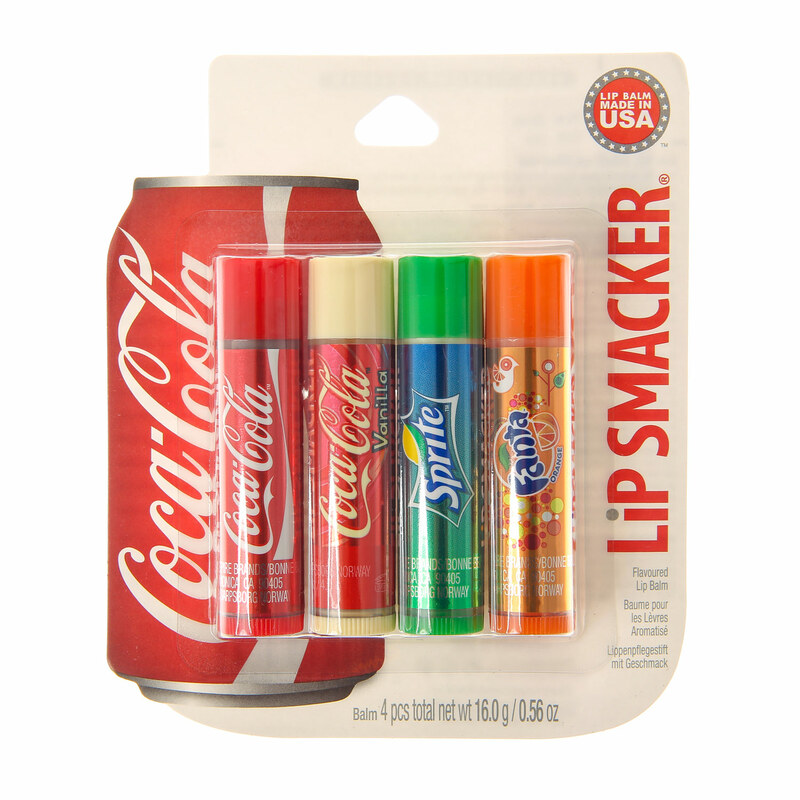 If you bought a 4 pack of lip gloss or matchbox cars from the dollar store open up the package and wrap each item individually. You just went from one present to four. Has your child been given a gift over the last year that they have completely forgotten about? Likely not even open? Depending on their age – grab the toy and re-wrap it – and stick it under the tree. In the boy’s stockings, we put some little toys and fun things – but we also put items like a toothbrush and body wash. If you already have an extra toothbrush stashed in your linen closet – grab it and wrap it up. They have no idea when you bought it! Start NOW! Start early – start stocking up on clearance items today. Buy what you can afford this week, and slowly start adding what you can. Buying what you can afford now will save you big bucks come December! 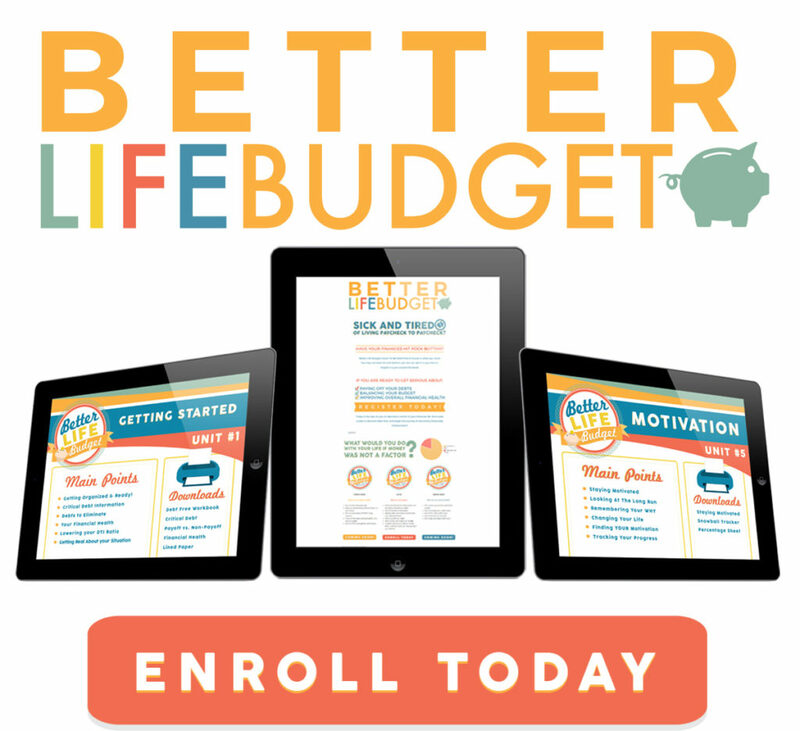 Not only can you grab the best deals – but it won’t seem like such a hard hit on your budget. We have a tradition of creating a special Christmas morning feast. It is not really anything more than a fancy Sunday morning breakfast – but the way I display everything it makes it seem extra special. Decorate the table! I like to have the table decorated and have it “set” once the kids go to bed. 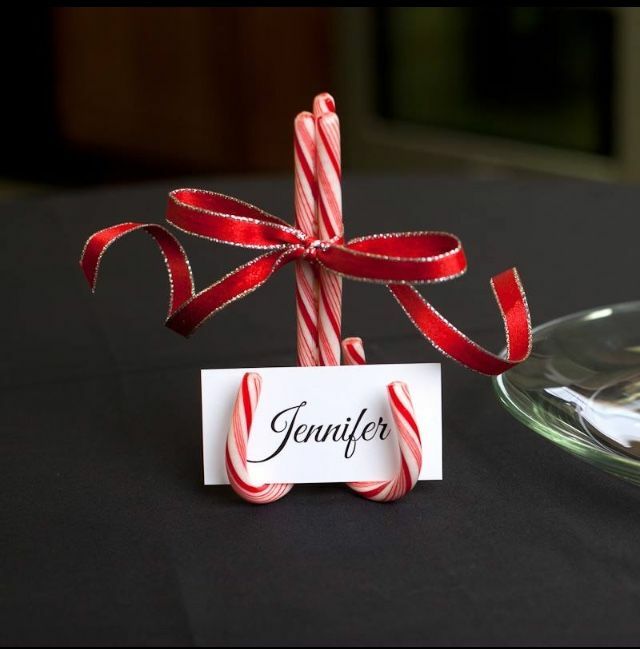 Little touches like these super inexpensive candy cane name cards – make the day feel so special. Combine that with a few other touches and you are golden! *These are so easy to make! Grab a holiday-themed plate or cup or straw. *Seriously, it is the little touches that make it extra special* You can grab a Santa themed curly straw and cup at the dollar store. Use the decorations you already own to create a holiday tablescape. Here are a few Holiday tables that I have done over the years. Grab some decorations off the tree to place on your table. The kids will be so busy with the gifts they will never notice the tree missing a few ornaments! We did this one Christmas Eve and covered the living room floor with snowflakes, and hung some from the ceiling. When Greyson woke up it looked like a winter wonderland! It cost us barely anything (we have copy paper on hand) and it made the living room feel magical! I do recommend starting this before Christmas Eve. Do a few every night for a week and you’ll be all set. I am well aware that you cannot completely ignore everyone else who does not share your same address. As well as you shouldn’t! that being said, you do not need to shell out hundreds of dollars on store-bought gifts. Get your kids involved to make gifts for people. You can go the cute/crafty route and make ornaments. I LOVE these! If you do not own one, borrow a pasta roller, and make homemade pasta and sauce. 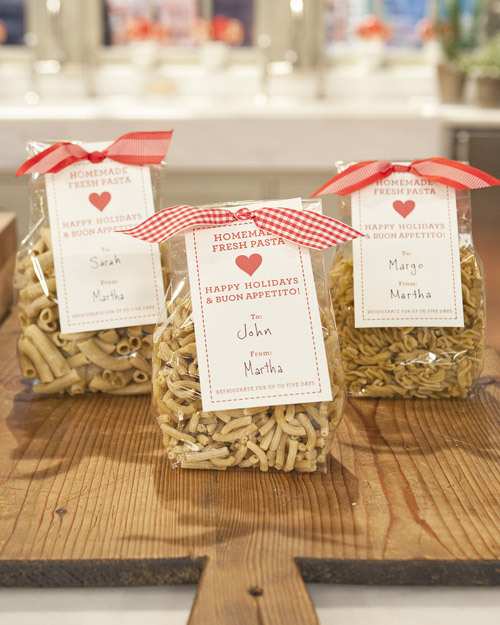 Pair it with a cute tag, and bag and you have an awesome present – that is useful and delicious and very inexpensive! Sugar body scrubs! These make wonderful gifts – they are beautiful and useful (Especially in the winter months!) 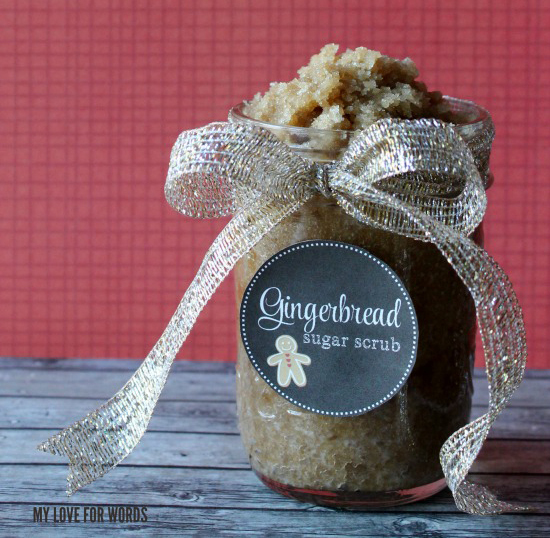 Emily from My Love For Words has some AWESOME sugar scrub recipe that are holiday themed (Peppermint Candy Cane, Gingerbread, and Cranberry)! Bonus – She even has really cute labels to go with them. Put these into little mason jars, wrap a ribbon and label on and you are good to go! You can take it up a notch by including one of these adorable mini wooden spoons. *I know I would love a gift like this! This is the real game changer. 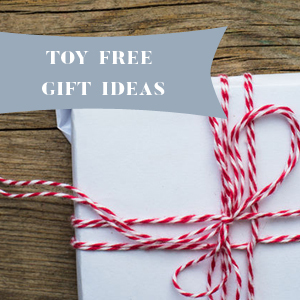 Even if you can purchase anything and everything you want this holiday season, these are some great ideas to make Christmas even more special. Once all the presents are open, there can be a sort of downfall after the high. So to avoid it – keep the excitement going all day long! After gifts have your “fancy on the cheap” breakfast. Everyone sit down together and enjoy your beautiful table and eat. 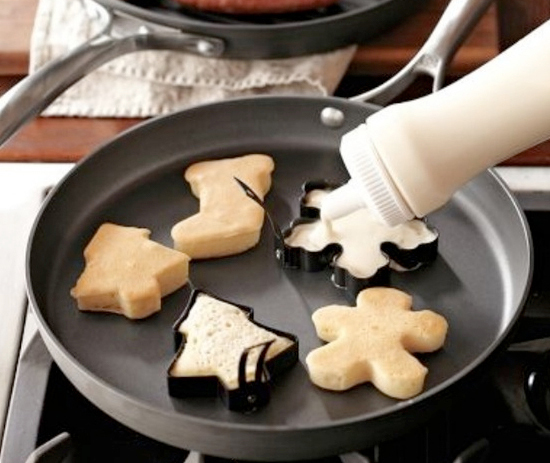 Pancakes are so inexpensive, but when you pour the batter into cookie cutters on the skillet it automatically makes them special. It does not cost you a dime extra! *Tip- spray the inside of the cookie cutter with olive oil, otherwise your pancakes will not come out… and make them “thicker” than normal! You could have a special movie afternoon. Have one of the gifts be a new movie, and snuggle as a family while eating popcorn and Christmas cookies and enjoy the new movie. If you do not like the idea of spending Christmas in front of the television, make the movie a family game instead! So much fun!! 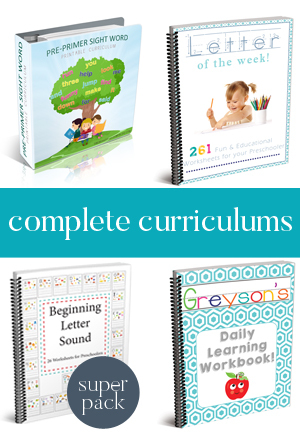 Click here to see some of our favorite games to play with our boys! Gifts are opened one at a time. Do not let it be a free for all! Open your stockings, then get some breakfast. Once your special breakfast is done, you can open the gifts under the tree. Make opening gifts more exciting. 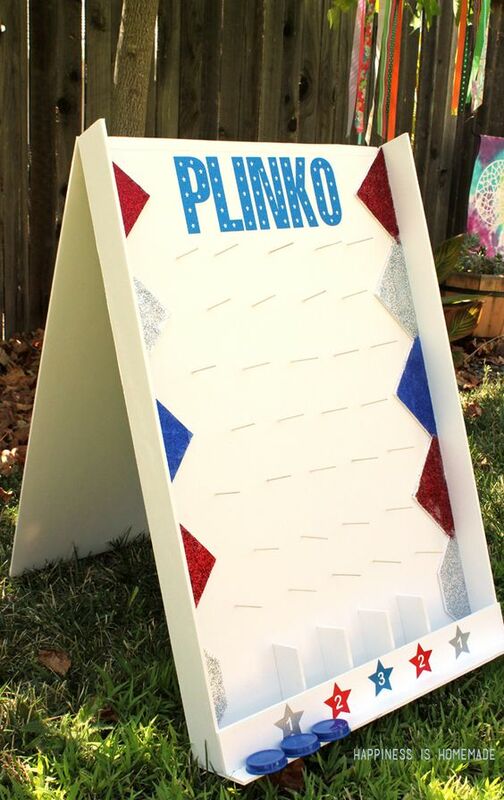 I am thinking about building this plinko game, and whoever’s name the chip lands on gets to open a present. Let the kids play with the gift that they just opened – rather than making them wait until everything has been opened. Make the first present the open a treasure hunt to find it! 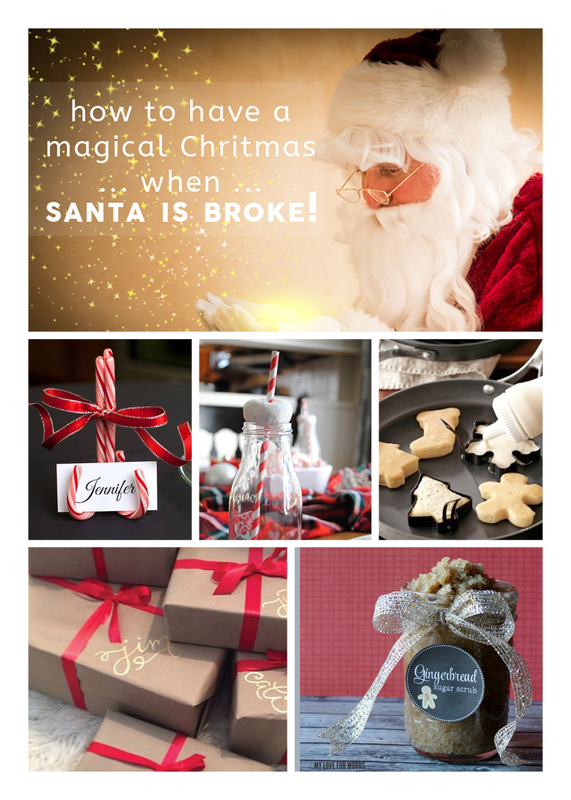 I have set up a Pinterest board where I will be pinning and sharing other awesome ideas to celebrate Christmas when Santa’s Broke. Be sure to follow along! 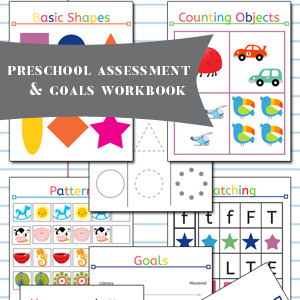 I love this whole page of resources from Organizing Moms! So much, good information! I hate the let down after all the presents are done. I have tried over the last several years to be super on top of my digital scrapbook game. I get as much of the year done to that point as I can and then put it on a disc so we can all watch a slide show of the year together. There are so many pictures that Dad has never seen! I have also done the family videos for the year, or even last year’s scrapbook printed out. It is so fun to sit together and do that! I’m stealing this one for Christmas Day, too! I buy 4 items for my 7 kids. Something they want,something they need,something to wear,something to read. I shop all year looking for sales etc. even with 4 gifts for the kiddos you are still buying 28 presents! Yowza!! My mom has always done this, and it’s always been more than enough! We love it! -Garage sales, thrift stores and online used sites. I am all for getting something nicer and regularly more expensive 2nd hand and paying way less for the same thing I would buy new in the store. These ones I make sure are in gift giving condition. – Experiences are also key, like you said. Little details or outings. We go to our city’s festival of lights every year, enjoy tobogganing, building snowmen, we make our own paper snowflakes and decorate the front window with them, we have a night where the kids all sleep around the tree, making and delivering goodies to friends and neighbours etc…. Love the Halloween candy idea!! Actually, I love ALL of these ideas! I took some of my sons halloween candy and made an advent calendar out of it.. awesome because of the variety! Some of the things we do, on a tight budget, is to try our best to create the most “home made holiday” we can! I found a book of Poems for Children at a used book shop, and took pages out and framed the poems with thrift store frames. I gave them to friends that have small kiddos, to hang in the nursery. Hope these ideas may add to other fun ideas you’ve heard! Yes!! I love passing out cookies. The $1 basket or you can get really inexpensive holiday tins at craft stores (You are right, do not for get the coupon!!). Put a piece of parchment paper, and a cute tag (You can make or find one to print off Pinterest) and you have a really nice / thoughtful / and useful gift!!! Our budget is always super tight, so we clean out the baby formula cans, pringles cans, coffee cans, etc… and re-decorate them with craft paper to make super cure containers for cookies for the holidays. I’ve done this before with multiple formula cans, and put in a Christmas muddy buddy type of Chex mix. One can per family at a large family Christmas get together. It was a hit. I remember everyone had empty cans by the end of the day. I have Christmas tins and gift bags in a hoard with the Christmas stuff. We’ve been passing some of them back and forth in the family for years. I hate buying stuff like gift bags so as long as they’re in good condition I save them. We pay cash for everything. All items are written down as they’re bought and we know exactly how much is spent. 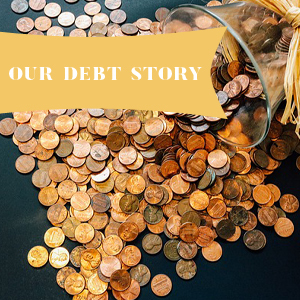 I grew up hearing the story of my parents’ first Christmas together, far away from family, and completely broke. Grandma had sent a check that bought them some groceries and Mom also picked up a tiny tree from a discount store and a bag of Hershey’s mini chocolates. She hung the chocolates in their brightly colored wrappers on the tree because there were no ornaments. We kept the tradition every year. When my husband and I had our first Christmas away from family, we were broke, and I dug through the recycle bin to find materials to make a star for our tree- cardboard wrapped in gold paper and secured with a ribbon. We used that star for years until it finally gave up. All that to say that a lean Christmas here and there can make some beautiful traditions and memories that wouldn’t be thought of otherwise. Also, look around to find what your local church is offering. Oftentimes, a holiday meal is hosted, or Christmas trees are donated. Christmas Eve services can also be a magical experience for the whole family to enjoy! I start buying one gift per payday in August and put them up. I like to get the kids sweaters or sweater dresses as one of their gifts. If you look on Amazon.com in the summer, you can often find these things marked way down because no one else is buying them. I buy a size ahead so that they fit in the winter. Also related to Amazon ( I swear I don’t work there!) – I check the open box/used section for toys and shoes. A lot of times you can get something for way less than the normal price because the box is a little damaged. I’ve never had an issue where something wasn’t in good shape. I refuse to go anywhere Christmas morning because the kids wake up so early and because they just want to play with their stuff – but both of our moms are local, so we invite the grandmas to join us for breakfast. Everyone loves it and it solidifies the family connection to Christmas. Thanks for sharing your tips! I’m already excited! Thank you I will check Amazon out. My husband and I were both previously married. We have a total of six children and we raise our grandson, as well. We have always enjoyed the family movies and played games. One year finances were extremely tight. We could only afford to buy each child one small gift. I then bought fifty small items (socks, toothbrush, candy bar, silly string, $2 CD’s, dollar bills). Anything that I came across that was inexpensive but either useful or funny. I wrap this gifts using wrapping paper scraps and put them in a large basket. Throughout the day, I randomly go to the basket and we play a home version of “Let’s Make a Deal” (some really useful or nice gifts and some gonks). Sometimes we sing songs or act act out Christmas movies to receive a gift. Other times, the kids each pick out the gift they want and then we randomly pull slips of paper out of a hat that give them instructions as what to do with the gift ( trade with the person next to you, pass the gift 2 times to the right). The kids never really know which gift they are going to get. It is fun. We go even farther and have a few costumes (elf, Mrs. Claus, princess) that you have to wear and model for everyone if you are lucky enough to receive them (my son makes a beautiful Mrs. Claus) . These gifts the kids return to be used again next year (in hopes that someone else will have to model for them). We also have a rule that you have to try on anything that can be worn (old fashion curlers, nylons). I will never forget the first year that we did this. My oldest son, 17 at that time, got a top songs of the year CD. He was so excited he ran to the stereo to turn it on. I’ll never forget the look on his face when he heard it. It was sung by kids. We all must have laughed for ten minutes. When the laughter died, he asked if I would do this every year because it was such a blast. I have. That seventeen year old boy is now 29 and is bringing gifts to put in the basket, as are some of the others. It was decided on that first trial year that we enjoyed being goofy and playing with each more than getting lots of gifts. Also as an added bonus, when some of the kids’ friends randomly stopped over to wish us a merry Christmas, they were included in the games. There many other games and variations that we have done over the years. Have fun!!! What a beautiful story and I am definitely going to do this game with my family. Thank you for sharing. Nice!! I love the games and will incorporate some this year. I love all of the ideas, and the Christmas stories as well. This year, extended family will be receiving home canned apple butter (easy peasy in the crockpot) . Now that our children are grown with families of their own we do ” our ” celebration on Christmas Eve. We have a beautiful dinner and open presents and our kids can enjoy Christmas morning with their families. Christmas afternoon is spent with my in-laws, the entire family doing presents , dinner & football in the yard. No matter how many desserts are made ,the grandkids favorite part is the birthday cake for Jesus, they always help me make it, simple red velvet cake with white icing and we sing happy birthday. Angie, thank you so much for mentioning the reason for the season! When my 8 children were growing up, we always sang Happy Birthday to Baby Jesus in the manger before we opened our gifts. I love these ideas! Here are some things we have done on tight budgets. Look up events in your town to go to. Many towns have a Christmas parade, or watch Macy’s parade on TV together. Craft fairs, church events and plays, ir walk through the mall people watching together. This was my favorite in high school. We would make up stories for the people passing by… Who they were buying for, what they had in their bags, where they were off to next. Make it positive because this will teach your kids to be aware of other people. My friends and I always went ice skating and sang carols through the mall. I did a scavenger hunt through the mall near Christmas for my youth group and they loved it! Some stores hand out pins and candy, give them a dollar in quarters and have them get candy from the machines, count how many snowflakes are in the window display at macys etc etc. My family planned things to do for others like, hand out candy canes in the mall, sing at the convalescent homes, make ornaments (my fav.’s are the cinnamon apllesauce and glue dough ornaments). We would go to the snow with hot cocoa and plenty of snacks (a camp stove to heat up homemade soup) was perfect after we built snow forts and threw snowballs. *hint* my mom put plastic bags around our socks and it kept our feet dry! Spending time with childhood friends for no other reason but to eat or make cookies and hot cocoa. These are my best childhood Christmas memories. GUESS WHAT?! I don’t remember the gifts I got, or how the house looked, or what we ate together. Make your magic through life experience but do it together. Merry Blessed Christmas to you all! We have five kids, and one year we went crazy with gifts, thinking it would be the best Christmas EVER! But it wasn’t … and I was the most disappointed. The kids loved their pile of “stuff” –they had so much to rip through about half of the gifts were seldom used, but I was left feeling pretty sad…in the end … it was a waste of time and money and energy…A resounding reminder you cannot buy Christmas Spirit… so from that day forward each year our kids received three gifts…and only three. One from dad, one from mom and one from the “family”. The family gift was a combination of grandparents, siblings, parents and friends. (It was a great relief for grandparents and extended family not to have to find something for each kid and instead just make a small contribution) .Because we knew each gift was precious, we spent the entire year choosing something that really “fit” with each of the kids…we took pictures when they opened them, and it took all morning … because everyone opened one, then we had breakfast, and cleaned up… then everyone opened gift two, and we watched a movie or played a game, (Usually Santa left a new game to the “family” which dad always opened and we played most of the afternoon) then in the evening —with jama’s on and Christmas lights filling the room, we opened our last gift and talked about what a wonderful day it had been… now our kids range in age from 45 down to 18, and between them, they have our 11 grandchildren, we are honored they have kept the same tradition in their families as well and look forward to our pictures of the family gift each child receives. I love all these ideas! There was a time when I had very little money and had to scrape by. Even though those days are gone, I’ve stayed with the ideas we came up with, as these Christmas’s hold such fond memories for the kids and I. Purchases in bulk and breaking the gifts to singles always made the most of a frugal Christmas. The kids always looked forward to their “Christmas jammies” that would keep them warm thru the season. We always made cream of wheat and mini MnM pancakes for breakfast. (I’ve converted to gluten free this past year, so things are changing up a bit in that department! ) That was our first thing to do in the morning. We always love going to midnight mass on Christmas Eve. I always make at least one homemade gift for everybody. This year I picked up a black canvas at Hobby Lobby (40% off coupon! ) and am making my eldest 25 year old daughter a picture with twinkling lights, made to look like stars, with the saying ” I love you to the stars and back. ” It’s a saying she never gets tired of hearing! We still go Christmas light viewing in the family car, and I still get lost each year! ! Love doing simple trinkets for the stocking, and yes, we wrap them all!! We take our mini daschund to the local nursing home to visit the residents. These people have had to leave their precious animals to live there, and seeing Diggy brings such a smile to their face. And we love to hear about their furry ones that they’re missing! My favorite Christmas memory with my grandma was when she pulled me around in a sleigh. I can’t wait to have grandchildren!!! We also make a birthday cake for Jesus each year. Yes, my fondest memories are those made with those I love. Gifts are such a secondary thought. When my daughter called to say she’d be able to make it into town this Christmas, she said, “mom, no gifts this year. I just want to spend time with my family and eat your homemade Christmas meal. ” What a blessing! ! Praying that all families have a blessed Christmas this year! ! A tradition my mother started that I’ve passed on to my thee girls is buying one ornament for each child every year and then recording it on a paper to keep in the ornament box. (We even noted when one broke) Typically each year the ornaments are similar. Then, when we graduated and move do out, my mom boxed up our individual ones so we had enough to start our own tree. My kids look forward to the ornament gift as much as a “real” gift. And it also makes decorating the tree that much more fun. They love to reminisce about how old they were when they received it. And, once again, they each will have a box full when they start their own adult lives. Oh, my mom also included a color photocopy of the list when she passed them on as a constant reminder. Love! We did the new ornament for our Daughter every year while she was growing up. She is now 36. Every year I tried to get her to take her ornaments. She never wanted them. Last year she said to throw them out. They are now gone. But I understand. My Mother had all her ornaments match. I did too. So I shouldn’t expect her to have mismatched ones. These are really wonderful ideas. Pinning and sharing. I absolutely love this list, especially wrapping each item and decorating after the kids are in bed. I thrift most of our Christmas gifts so our dollar stretches much farther. You post was nice but it really didn’t hit the spot for a family like ours that does not have any money for the Holidays not even dollar tree items. I was looking for a bit more then you could provide but there are good ideas for people with little money, not NO money. Have a Great Holiday. Pam, there should be an organisation like a church or charity in your area that will be able to at least give you a little help. I hope things work out for you! I found that getting the kids involved in making their own gifts was more fun for them (especially when they saw the person they made it for opening it) than anything…even if it was just a picture they drew. If you have crayons and paper you can make a book for each person..everyone draws pages and contributes pages they want to put in and Mom collects and puts the books together…it is a surprise for everyone, because the complete story is only read when opened on Christmas morning. We talked about it as a family, and we started at Thanksgiving… each morning we would pray together and thank God for our blessings… and then each day before we prayed we took turns reading a scripture about gratitude… when it was our turn, we would find a scripture, read it, and then say something we were grateful for. With our large family we each got three turns before Christmas time… then by the time Christmas game, our hearts were really full with feelings of gratitude. It made a warm happy feeling that carried into the second thing we did. We CATALOG shopped as a family… meaning, we looked through catalogs and cut out pictures of the things we would give each other if we could! It gave many happy feelings to see what people wanted to do for you if they had the resources! It was better than all the cheaper presents we have done for years, you know, when you take your $10-15 and make it do. With the catalog shopping, people could see what we really wanted to do, and felt the love! It was really a warm loving happy Christmas. Other times we have written letters, letting experiences together that we treasured. A coupon book with acts of service… “I’ll clean the kitchen for you” has been another treasured gift. I can tell you than things bought from the store usually fade from the memory. Gifts of love last forever! Make it about love! We have chosen to limit Christmas gifts this year and make it more about acts of service. However, we still have small gifts – everyone gets new socks and underwear (favorite characters for the littles). As far as stocking stuffers go, there are a ton of cheap to free ideas. For example, Kroger has Free Download Fridays. A lot of items are bigger or not good for stockings, but I’ve got plenty of small packages of candy that will be perfect. Don’t throw out the coupons for toothbrushes – use them at Dollar Tree and it will be under a dollar if not free! Love coupons are always great, too. I make these for most holidays and it never fails to amaze me how excited they get when they open these. I love this article! When I was a kid, my Mom wrapped everything in the Sunday comic page of the newspaper, and we made all our own ornaments for the tree including string popcorn. We even made very basic sugar cookies for Santa. Mom would put (probably watered down) milk out with them. We had very lean years for most of my upbringing, but I was never disappointed. I think the main ingredient for the holidays is love, and I can honestly say I never felt unloved, despite lack of the year’s trendiest gifts. Much joy to you and yours this holiday season! I lost my job and hope to be able to pay the rent at the end of the month while still feeding my two children. They are both in their late teens, so it’s not as if they don’t understand that there really is NO money for Christmas this year. I feel like I am really letting them down. We have no other family, so we are going to just have to push through this difficult time. I would appreciate any suggestions you have for me that will keep Christmas from being a total disaster this year. I’ve had my share of lean Christmases as a child and a parent. This is how to make things “lusher” without spending a dime..
1. Mom never put any of our gifts out until after we went to bed Christmas Eve. We had our Christmas with our extended family that night and we’d only open the gifts brought by those folks. Any gifts from family not attending were kept for Christmas morning. It also gave mom time to start coffee and dad got the camera set up to catch our reaction as we came into the living room. The kids of my generation have stockings made by one of our aunt’s and they’re all different. I continued the tradition by making stockings for my daughter, grandkids and great grandkids. 3. On Christmas morning the youngest “child” that can read is “Santa” and hands out the gifts. We start with the youngest and they pick one gift, look at the tag, thank the giver, and then gets to open the gift. Then the next oldest does the same thing and on around until it is back to the youngest. My mom said she started this to make the present opening go longer. It also gives others the chance to see unique gifts closer and see the reaction when each person opens their gift. 4. Instead of turkey, prime rib, or ham with the trimmings, we have spaghetti and meatballs from my mom’s recipe. I go up to my granddaughter’s home a few days early. Her daycare provider doesn’t work Christmas week so I take care of my great grandkids and enjoy them during the day. I mix up cookie dough and freeze it earlier in December and take it with me. Then we can bake cookies and make other treats at night. So the focus of our celebration is on family and off the number or cost of presents. When my daughter came along we started our own “Santa” tradition. He doesn’t bring anything advertised on TV and Santa is actually a personal shopper for Mom and Dad and has to work within their budget. I got the sweetest and most inexpensive neighbor gift once. They took an empty peanut butter jar and mixed up some homemade chai tea. They drew a little card and tied it on. I can’t imagine it cost them much of anything but it was so sweet and a way for them to participate. If you go to any place that’s selling Christmas trees, they always have a big pile of discarded branches you can have for free. I have tied them together to make garlands and hung ornaments from that, or one time I made a tiny “tree” from tied together branches stuck into a can full of rocks. I have also hung ornaments off the ceiling. To manage the after-present let-down, my mother would always ask us questions, like “Which of your brother’s presents do you think he likes the most?” and even “Which of your sister’s presents do you like the most?” Sometimes it would be something she didn’t want anyway, so she’d toss it over. My grandmother found out we did that so she stopped putting names on the gifts; she just bought one for each person and said we’d throw them around anyways so we could decide who wanted which one. Another family tradition that cost nothing and made the holiday feel special was going to midnight church services. When you are a little kid, getting to be out late at night is pretty special and magical. My mother kept all her advent calendars and there were always plenty to open the doors on. And we had camels that we moved around the living room a little more each day until they reached the creche on 12th night. Oh, yes! I love to get a nice bunch of cut off branches from Christmas tree farms too. I usually spread some among my artificial tree’s branches to give it that real tree smell. I also make little springs to decorate presents with, or to hang around the house. It looks pretty and adds a fresh scent to the house. It makes Christmas feel more alive! Love these ideas!! Between mine and my husband’s children there are 8 total. Money is always tight here. All of our gifts are small. Then one “nice” gift..nice being $20 or less. This year we started a tradition where we save paper grocery bags and let the kids decorate them on Christmas eve. Then use the bags to keep all their stuff together. That is amazing! Could not love this any more! Thank you for this post. This year has been really tough financially. We have five kids and I have been putting Christmas off. We bought some gifts for everyone but so little. So much less than what they have gotten every year in the past. It’s just so hard, especially with five kids. I feel like they are going to be disappointed. But I’m going to try and make it a magical morning using some of your tips. I love the breakfast idea too. I’m going to bring out champagne glasses for the orange juice and make pancakes, bacon, eggs and sausage. A little feast . I’ll string paper snowflakes throughout the living room as well. Have some games planned for after they open gifts and of course watch a Christmas story with them. I’m also going to add stocking stuffers and wrap them like you suggested. Chopsticks, hair accessories, dollar store stuff…. thanks for your suggestions. I felt so down lately and was dreading Christmas because of our financial issues but I feel a little more excited now. I just want to make my kids happy and hope they have a beautiful day. Thanks again! We can now afford to spend more on Christmas but do it on a budget instead so that we can help some children through our local Salvation Army. For Christmas, my own children get name brand clothing, books and board games from a local thrift store. I collect items all year from our local recycling giveaway shed. Our local library has a huge fundraising sale twice a year where a paper grocery bag full of books is only $5 on the last day of the sale. I get books for the whole extended family for Christmas this way, including some oddities that would be hard to find somewhere else. I send off for shampoo and other samples and save them for my daughter’s stocking along with perfume samples from magazines. I agree that it’s all in the presentation! I would like to thank everyone’s participation in this post’s comment section because it has been so heart warming to hear how everybody spends time with their families. That in and of itself is something tremendously wonderful to witness. It’s just October for me but I have been in such a mood for Christmas because of how much I miss spending time with my family . My brother is in the military and my other brother moved out so with just my parents and I it can be lonely. Sometimes I don’t know how to start a conversation anymore, it all feels so different. But I know if I was any one of your children I would be so grateful to have received such love from the things that truly matter in life. I can share a low cost gift I like to make for co-workers as well as more distant friends/acquaintances who I know will be getting me something, and sometimes even for more distant relatives. I like to go to the Dollar Tree and choose some Christmas mugs. I then choose a theme, like this year will be candy cane/peppermint. I try to find things that match that theme to fill the mugs. I plan to use mini candy canes, peppermint coffee or tea singles, candy cane flavored candy like Hershey’s kisses or peppermint patties, peppermint chapstick. For the women I may add of substitute some of those things with mini peppermint hand lotion and red and white striped fuzzy socks (the Dollar Tree ones are actually good quality), while kids will get peppermint striped pencils and erasers. Basically anything that I can find at the Dollar Tree or other places for a reasonable cost. Target is a great place to find single serving sample coffees in lots of flavors. If I want to make a bigger gift of it for closer friends or family, I will add a ten dollar gift card to Starbucks or Amazon (both are sold in packs of 3 for $30). I arrange all of the stuff in the mug and then wrap it with tissue paper and/or those clear gift basket wrappers from the Dollar Tree, cut down to size. It’s an affordable and cute gift for those you feel obligated to buy gifts for. However, I try not to give it two years in a row. Usually costs about $5 per person if you buy multi-packs of most things, depending on how much you add, with the gift cards obviously making the price go up to around $15. You could fill a mug with just bulk holiday candy for even cheaper, which I have also done before. To make the initial view if the tree more exciting, mom would always lay the package out, there may be space in between them, but don’t stack all if them under the tree as tight as you can. You might lean a flat box on another to give the illusion of stacked gifts…there were 7 kids in my family and half the living room was covered with packages Christmas morning. They, in reality, would all have easily fit under the tree. YES!! Bring those gifts out from under the tree! Love these Ideas but they do not correspond with the title. I would love a post that actually has ideas for people who literally have no money, whatsoever. I agree… same thoughts as yours. My children are grown now, but one year when they were around middle school age things were pretty lean and I was only able to get them each one small gift. I did , however, put a table cloth on the living room floor, I lit candles and we ate Christmas dinner on the living room floor by candlelight. They have spoken often of that Christmas and how it was a favorite of theirs. 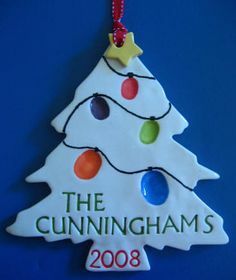 How do you make the letters on the Christmas tree ornament that says The Cunninghams? Thank you! Every year we take out our Christmas decorations and one of them is a tic tac toe game (green and red board, trees and santas as the pons) our kids spend so much time playing this simple game and we usually find ourselves in a family challenge. This has been going on for at least 20 years and its always new and exciting. The title of the article was about not having money… for a tree… yet you kept talking about gifts under the tree. I’m confused. And when adding up all those things that you mentioned it would get pretty pricey. Brown paper, fancy writing pens and ribbon cost as much as wrapping paper at the dollar tree. Making items gets costly too… maybe not as much as shopping at Neumann Marcus but some of us don’t have ANY money. Bottom line.. I was looking for an idea for the missing tree that we can’t afford this year and … I didn’t see anything and have no ideas after spending time reading your article. Disappointing. You should re-word the title of your page. Most people are not starting from zero. They probably have some Christmas decorations from years past. If not? No money for a tree. I would literally get some big branches from outside and put it in a vase or basket – and decorate that. No bulbs? use popcorn. It might not be the prettiest, but with a little time it could be cuse. You don’t have to buy brown kraft paper – ask for brown bags at the grocery store, next time you go shopping. At aldi’s you can buy them for 5 cents a piece. No fancy writing pens, literally a sharpie – and taking the time to make the handwriting fancy. Great ideas, one thing you could do is put your childs name on a towel. It could even be a towel you already have. Make the name out of a cute fabric, could be a favorite dress that is no longer used or Dad’s old shirt in a pretty plaid. A fabric store has a fabric that will stick on both sides when ironed, just put it between the towel and the fabric letters and iron. One year I made pillow cases for each person out of a fabric that was special for them. Hope this helps it can be a hard time of year and a good time to start some family traditions that will be remembered for a long time. I enjoyed reading ur post great ideas thanks merry Christmas!! I love this post! It has some great ideas!